The Dream edged the Sparks, 76-72. The Liberty got past the Sun, 64-57. They’ve won two in a row, while Connecticut has now lost five straight. 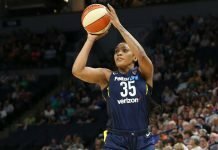 New York rookie Kiah Stokes broke the single-game franchise record, with eight blocks. 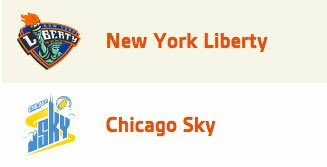 The Liberty are tied for first in the Eastern Conference with the Chicago Sky. Guard Monica Wright is out indefinitely after undergoing arthroscopic knee surgery today. Epiphanny Prince’s arrival is raising New York’s hopes of returning to the playoffs. Rookie Kiah Stokes is working well with veteran Tina Charles. Season ticket holders staged a rally last night to keep the team in Tulsa. Rookie Brianna Kiesel has played an increased role for the Shock as injuries have occurred. Marissa Coleman has found the right fit with Indiana. Minnesota senior Rachel Banham plans an epic return this season. It’s game time for the Pan American Team. Canada wants to win without showing their hand. The U19 team went 3-0 in exhibition play.